Discussion in 'Whitetail Management' started by Central Iowa, May 9, 2011. Apple tree damage. I'm learning the hard way on many things on theses trees I have two apple trees that some critter gotten into and the bark is stripped on the outside but not all the way through. These trees are leafing out is there anything I should do to help them by painting, wrapping etc? Classic vole damage. If they haven't girdled them completely they should heal over. I would not paint or wrap them as that will inhibit it's ability to scar over. Depending on the severity of the damage they will leaf out but it's also possible the stress will kill them over time. Next winter I would spray the trees before the snow drifts them in. We have a small orchard and had the same damage last year; didn't touch them this year. We had the same problem with our apple trees. Mice were under the deep snow and chewed the bark off. Usually we have rabbit problems but we put tubes around them last fall. We bought some stuff at Menards for this problem. Its black in color. Spray it on and it stays on. It worked great for our trees. Thanks, if any of my first plantings make it it will be a miracle. Live and learn. Whenever you plant a tree put some kind of wire mesh/hardware wire, something in a wrap one to two ft. up the trunk. The solid plastic wraps are not good because they encourage borers under them. I learned that the hard way. A planting tube is good, but not tight against the trunk. Open mesh though,,is better. 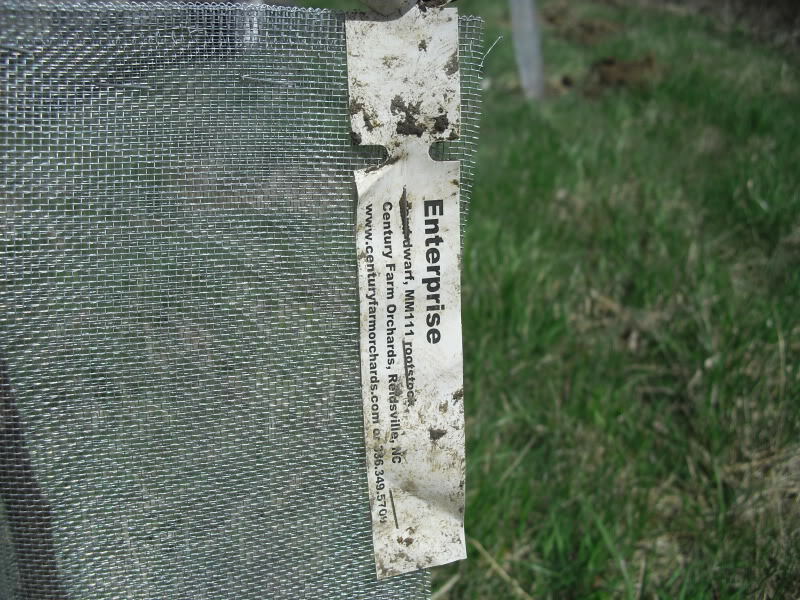 Use aluminum window screening and staple it tight to the trunk, I put some dirt over the top and also keep a 4 foot circle of bare dirt around the seedling and you should not see any problems. Never had any problems either with the vented tubes keeping a 4 foot bare circle around the apple trees. I just fertilized and mulched around my apple trees. I have them fenced for deer but never worried about mice I guess. Will they burrow under the mulch this winter? Guess that's what I get for trying. Yea,,get some kinda wire mesh or screen around those trunks! Rabbits will girdle them in my area overnight! I use aluminum window screen stapled around them...very cheap and very effective. Good stuff, Thanks. 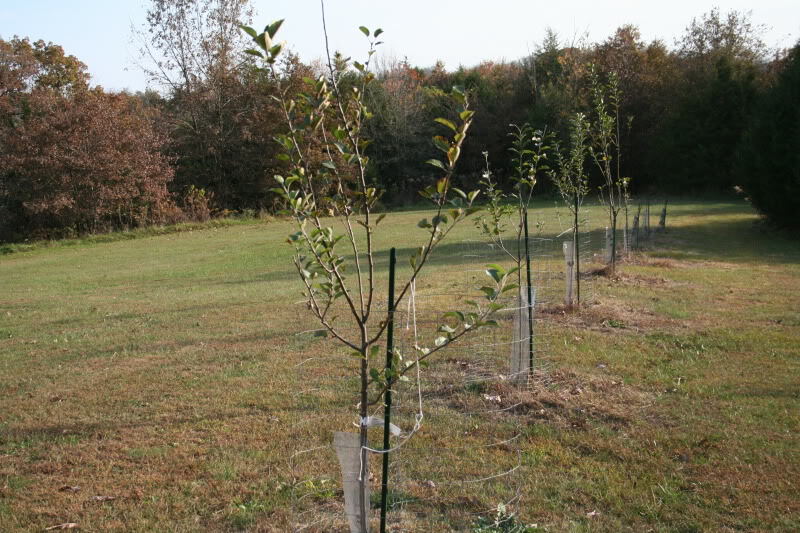 What size and kind of tubes are best for fruit trees? Tubes aren't recommended for fruit trees Travis and you'll notice that commercial orchards do not use them. The limbs need air and pruning/tying to encourage proper growth stature and they can't do that inside a tube. Very good info for sure! That first pic made me chuckle Paul. Seems you have the same "fertile" clay knob soil as I have! Do the fertilizer spikes they sell work for trees or are you better off using a compost/mulch for them? 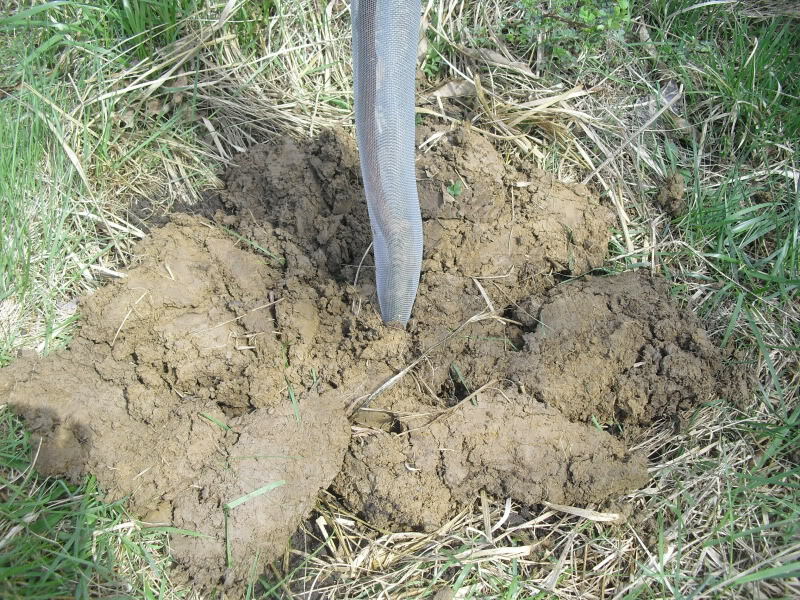 I know there can't be much nutrients in the clay based soils I have been planting trees in. The stakes will work but I just pick up a bag of triple 10 (or some such) and sprinkle a cup or so around the drip line every spring, a little pellet lime is helpful as well. I consolidated a great deal of information on growing fruit trees into the first page of the apple/pear thread. There is detailed information on almost every aspect of growing and caring for fruit trees. If I'm missing anything give me a shout and I'll add it to that post.